Vantus Loreius is an Imperial citizen who lives at Loreius Farm with his wife Curwe. During the related quest, you can help him try and get rid of the jester Cicero or persuade him to repair Cicero's wagon. If you go along with Loreius' plan, it will result in he and his wife being killed after the completion of the quest. Loreius dedicates much of him time to working on his farm alongside his wife. He begins his day by waking up at 7am to have a one-hour breakfast inside his home. Once he finishes his meal, he will head outside and will work around his farm for the next 11 hours. He can usually be found tending the field, but may also be found occasionally taking a break by sitting on the chair on his porch. After a long day of work, he will head back inside his house at 7pm to have dinner. He will find a seat and enjoy his meal before going to bed at 8pm. Loreius wears a set of green farm clothes, a pair of gloves, and a pair of boots. He is equipped with an iron dagger, and carries a key to the farmhouse, as well as a selection of common items and gold. Curwe: "I had a look at that boneyard the other day, Vantus. The one to the Northwest." Vantus: "I told you I don't like you going there. I've seen scavengers picking at the mammoths. They could be dangerous." Curwe: "You know, I was thinking of expanding the herb garden. Make room for some new plants I'm planning." Vantus: "That should be all right. How much space were you planning?" Curwe: "Oh, half the field should do." Vantus: "Half the field? What could need half the field?" Curwe: "I just think pollinating would be easier if I could do a lot of plants at once." Vantus: "Uh... why don't we talk about this later?" Delayed Burial: Convince an unwilling farmer to help fix a stranded jester's broken wagon wheel. When you first approach Loreius Farm, you will likely see a broken wagon on the road in front of the farm. 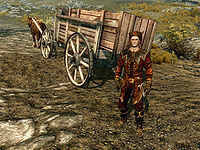 A jester by the name of Cicero is the owner of this broken wagon and he will ask you to have Loreius fix his wheel: "Go to the farm - the Loreius Farm. Just over there, off the road. Talk to Loreius. He has tools! He can help me! But he won't! He refuses! Convince Loreius to fix my wheel!" If you talk to him again, he will tell you where to find Loreius: "The farmer is at his farm! Where else would he be? Loreius is his name. Talk to him. Convince him to help poor Cicero." "Or maybe you missed the demented little man in the jester's garb, down by the road?" I won't condemn an innocent man. "Hmph. Fine. Suit yourself. But you're wrong, anyway. Just look at the fool. I don't know what it is, but he's damn well guilty of something." I'll do it. I'll report Cicero to the guard. "Ha! Wonderful! Like I said, the guard is down by the road. You really can't miss him. You tell him that jester is up to no good, and he'll deal with it. Then come back here, and I'll toss a few coins your way, yeah?" Earlier on in the conversation, if you instead said that Cicero is a stranger who needs assistance and asked Loreius to do the right thing, he would have become very annoyed and said, "What? And just who in Mara's name are you, anyway? Hmm? Come here, telling me my business. And for what? To help a... a... a fool!" Regardless of whether or not you talked to Cicero, you can then choose to persuade him to help Cicero. If you succeed, he will say, "Look, I... I... You're right. You're right. Feller might be nutters, might not. But fact is, he needs help. I turn him away, what kind of man am I, hmm? Look, um... Thanks. And I'm sorry for my unneighborly reaction. If you talk to Cicero, you be sure and tell him I'll be down to help soon." Otherwise, you can say that he has swayed you and he will then tell you about his plan to lie to the guard again, with the same dialogue options as before. Depending on your previous actions, a number of different dialogue greetings and options are now available when you talk to Loreius. If you did not agree immediately to lie to the guard, Loreius will now greet you with: "I thought we'd talked enough. Unless you've reconsidered my offer? That Cicero needs sortin'..." This will result in three previously documented options being possible, namely being able to agree to the plan, say that you won't condemn an innocent man, or the option to persuade him to help the jester. If you exit dialogue before choosing any of these options, he will mutter to himself: "A jester. In these parts. Man must be completely off his tree." Alternatively, if you immediately agreed to tell the guard that Cicero is up to no good and did not agree to help Cicero beforehand, he will urge you on: "You need to report that crazy jester to the guard. He should be patrolling the road." Finally, if you persuaded him to help Cicero, he will say, "You can tell Cicero I'll be along presently. I just need to do a couple things here first, and gather my tools." When you return to Cicero with news that Loreius will help him, he will be quite pleased and he will give you your reward of leveled gold. He will then patiently wait for the repair to be completed: "I will wait for Loreius! Oh yes, mother and I will wait right here, right here until he fixes our wheel." If you talk to Loreius again after completing the quest this way, he will reassure you that he intends to repair the wagon: "Just need to gather my tools and finish up a couple of things. No worries - I'll see to Cicero, make sure that wagon gets fixed." "Damn that Loreius. Oh, how he will pay for this treachery..."
Alternatively, you can choose to lie to the wandering guard and say that Cicero has committed some crime. Cicero will become outraged when he is confronted by the guard, blaming Loreius: "Damn that Loreius. Oh, how he will pay for this treachery..." Once the deed is done, you can return to the farmer who will ask: "Well? Is it done? Have you reported the fool to the guard?" When you tell him that you have and that Cicero won't be bothering him, he will cheerfully say, "Ha ha! Oh, I knew I had a good feeling about you! Here, my friend. A few septims, to show my thanks, hmm? And may that twisted little jester rot in a cell for a fortnight! " He will then proceed to hand you the same amount of leveled gold that you would obtain if you would have helped Cicero instead. 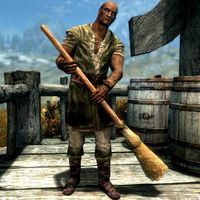 If you talk to him again, he will mock Cicero: "Little fool's going to experience the hard reality of Skyrim justice, eh?" Unfortunately for Loreius, Cicero is more dangerous and demented than he could have imagined. He also happens to be a member of the Dark Brotherhood. As such, if you told the guard he committed a crime, he will get his revenge by killing Loreius and his wife. Should you return to the farm later, the patrolling guard will warn you about the gruesome scene: "You don't want to go up to that farmhouse, citizen. It's a terrible sight. The farmer and his wife, slaughtered in the night. 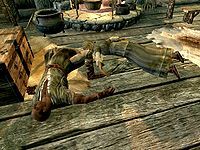 So many knife wounds..." If you later join the Dark Brotherhood and completed this quest, Cicero will briefly mention Loreius' fate if he killed him: "Now Loreius. Loreius has learned the meaning of ugly." Two unused lines of dialogue exist for Loreius in the Creation Kit. The first is a goodbye that was meant to be said when you agreed to Loreius' plan without ever saying that you won't condemn an innocent man and also never agreeing to help Cicero. It cannot be heard as you cannot enter conversation with Loreius at this quest stage. He would have said, "He he. That'll teach the little loony." The other unused line of dialogue was meant to be said after you told Loreius that you reported Cicero to the guard. However, other dialogue takes precedence. He would have said, "Ha! That'll teach the little jester to go bothering the decent, hardworking folk of Skyrim. Fool never should have come here." This page was last modified on 13 June 2017, at 16:43.